Rich Business Theme is another best corporate theme by RichWP which is similar to previous business themes with little changes. The modern concept of the theme allows you to turn your website into any type of look, either you may create clean looking homepage or change it to totally different stylish website. Whatever look you set for the website it will never miss the real goal to present your business in the finest possible way with best products or expertise shown at the homepage. The main design on homepage is made of widget based columns, that means customizing homepage with Rich Business WordPress Theme is very easy and quick even for the regular business person who don’t know programming. There is no need to change even a single code on the coding page to derive all the stylish effects as shown in the demo. list of widgets and options is the main game changer which needs to be operated while working on website setup or customization. Color scheme and fonts are also flexible, if you happen to face change with latest trend requirement the theme won’t prove outdated because you may change any portion from options page. Moreover WordPress is constant improving CMS, Rich Business Theme from RichWPdeveloper is supplied with commitment to release free updates to make useful for the future changes and requirements. This deal only requires you to purchase it once and get support and updates forever. Slideshow box at the homepage is made from large box which is enough to accommodate any image for product or latest service. The timing for slide interval and auto sliding features are also attached in the slider options section. Fonts given in the default is best and easily readable, if you still want to change it to some other bold of unique style then typography page is not far away from your reach. 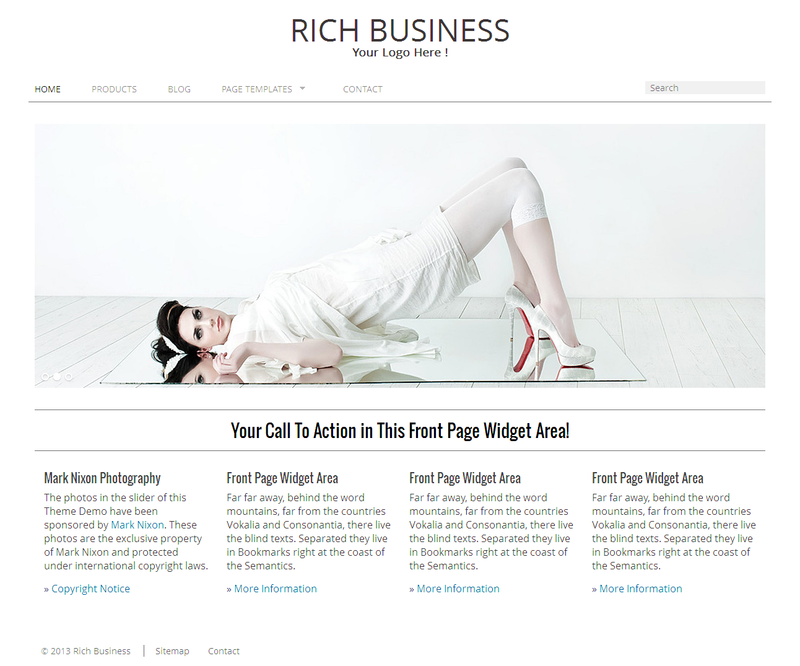 Rich Business Theme makes perfect user of big footer panel by putting four widgets space to add custom link or contact details whatever you like. The page templates for blog, product page has two columns style to make featured post sections for better display. Sidebar located on the right side is best place to add offers, banners or recent product or blog posts to announce updates globally. Sidebar is always visible on all the areas of sidebar and that’s why it’s said to be small but most important call to action panel for all purpose. Search engine powered design is made from HTML latest coding practice to guide crawlers to the right direction to take all latest in consideration. I hope you will enjoy watching demo and then make a decision.